The main menu above is your control center for all 12 iWalkObservation tools. Each of the nine single level tools are ready to use while the three multi level tools await your school and district look for lists. All 12 are highly customizable to meet your schools and walkthrough/observation feedback needs. The Goals and Conference menu is a control center for all your walkthrough data. View stats on all your walkthrough and conferences or select an individual teacher to quickly review their goals, conferences, professional notes, and classroom walkthroughs. Set your email preferences, add staff, edit look for lists and fine tune all your settings from the configuration menu. Noticings and Wonderings tool providing narrative feedback on what you notice and wonder about classroom instruction. 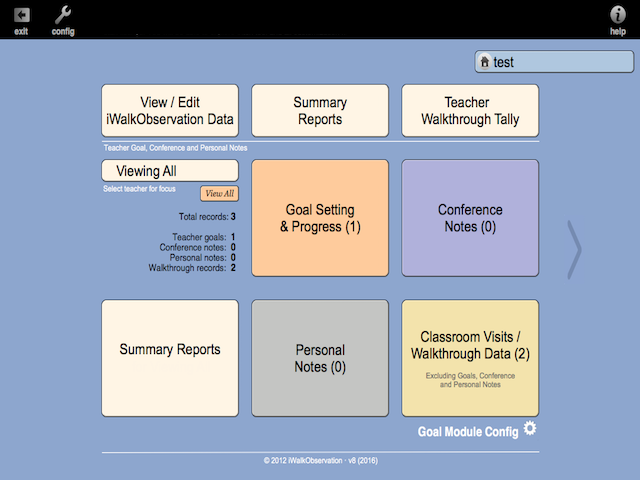 The OnTask tool provides on and off task counters with a narrative space to focus your observation on student engagement. Advanced Task takes the OnTask Tool further providing the observer with six counters that can each be individually set for observables and noted as either on or off task. Higher Level Questioning uses Blooms, DOK, and/or COSA questioning strategies to document instruction and rigor. The Elements of Good Teaching tool utilizes common best practice statements to provide overall feedback on sound instructional strategies. Each tools elements are 100% customizable to your needs. The Look fors tool is fully customizable allowing the observer to create and integrate an endless number of look for lists into their observations. 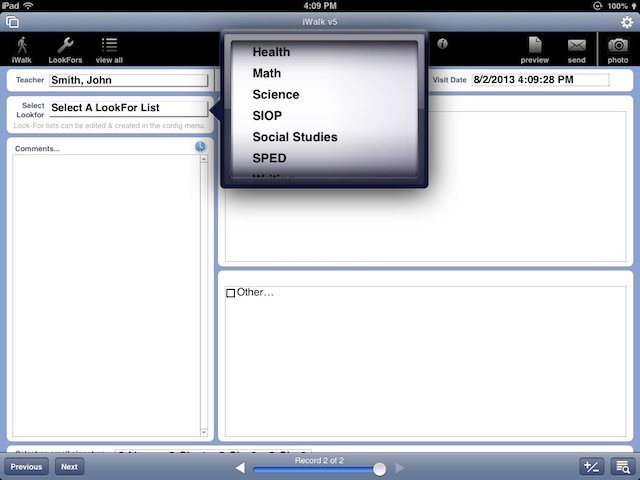 Lists are organized by teacher and student look fors and can be easily combined to create dynamic effective feedback. 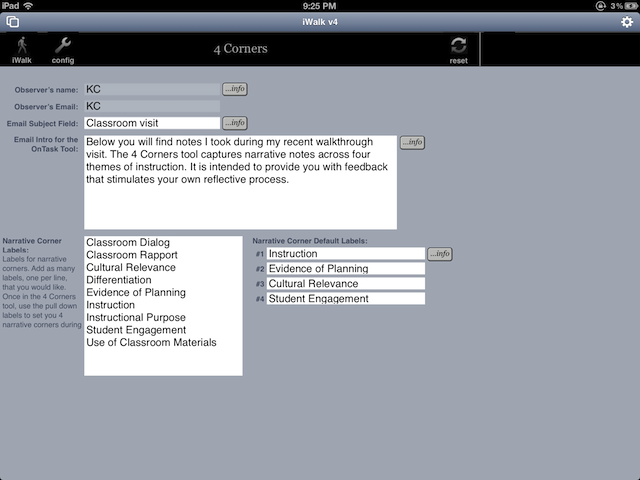 The Look For tool now includes the Classroom Rapport look for tool. Four Corners is a narrative cool allowing the observer to focus in on one to four narrative or verbatim text. Effectively focus you feedback on teacher goals! Keeping Time provides time counters for teacher/student talk, whole to small grouping, and instructional release. Easily capture narrative notes while keeping time. With Standards Over Time observers capture observational notes on observed teachers standards, recording these observations over time. The tool is intended to capture observations on a single, user-defined teaching standard or evaluation look for. 4x20 is a look-for tool organized into four topics. Each topic can have up to 20 elements allowing for a quick checklist of observed items. Create an unlimited number of 4x20 walkthroughs. Send your feedback with an attached PDF of all lookfor elements noticed and not noticed. Targeted Comments allows the user to create look for lists that focus comments speciific to look for standards and elements. This helps both the observer and the observed focus on explicit feedback to improve instruciton. Users are able to create an endless number of 20 element look for lists with focused element by element comments. Expanded Rubric is a 6 topic, 6 sub-topic, 10 element rubric that provides you with a 360 element based rubric tool. A perfect solution for school evaluation rubrics. The report menu allows you to create reports by date, teacher, or iWalkObservation type from across all your iWalkObservation data. Add up to four photos with captions to most iWalkObservation tools. Photos are sent by email as an attached PDF document. 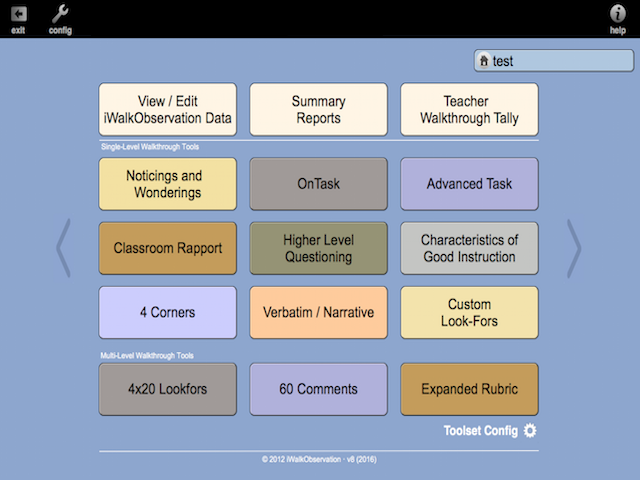 Teacher Tally gives you a glance at all your iWalkObservations organized by teacher and tool type. Perfect for quickly noting who you have and have not visited recently. With staff import, users familiar with csv files can easily upload and import full staff lists. Easily share lists with colleges to save time entering staff names and emails. Send your data to us and for a small fee, iWalkObservation will handle the techie stuff. Every tool can be easily customized to meet you school’s observational feedback needs. 4Corners can be customized in many ways. Like all other tools, the email introduction is customizable as are the titles for each of the drop down narrative menus. End each iWalkObservation with one of three optional signatures. From the tool, simply select Signature 1, 2, or 3 and your customized text will be added to the email sent.